Across the bottom of the panel, before a high stone wall, fourteen holy figures, including all the apostles except Saint Thomas, stand in a circle around the Virgin's bier, which is draped in a cloth of gold, as is the catafalque on which it rests. Saint Peter, at the left, dressed in the robes of a priest and with a pallium crossed over his chest, reads the Office of the Dead, while Saint John the Evangelist, at the far right, holds the palm presented to him by the Virgin, which, in turn, had been brought to her by the Annunciatory Angel as a sign of her impending death. Four apostles in the foreground bend forward to lift the poles of the bier, one pulling back his sleeve for the task, another pointing toward the unmanned pole opposite him. Behind the bier, Christ cradles the soul of the Virgin, represented as a small, child-like figure, in the crook of his arm. Above the wall, set against a symbolic gold ground and portrayed on a larger scale than the scene below, theVirgin ascends bodily to Heaven, encircled by twenty-one singing, dancing, and music-making angels. 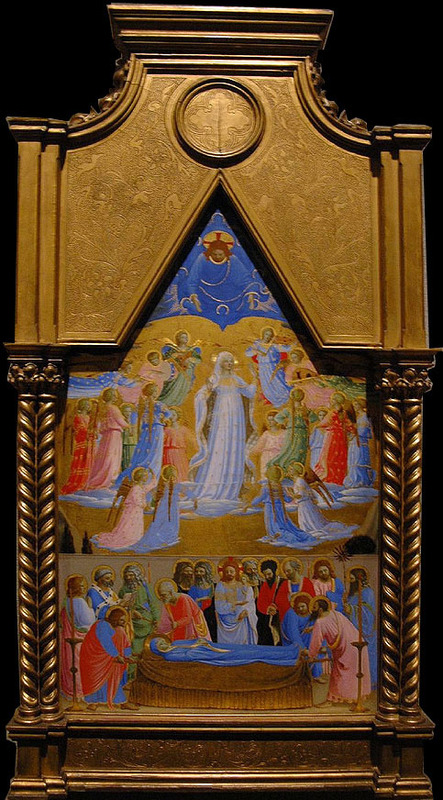 The triangular pinnacle at the top of the panel is filled with a dramatically foreshortened figure of Christ in a mandorla of blue cherubim waiting to receive his mother in Paradise. 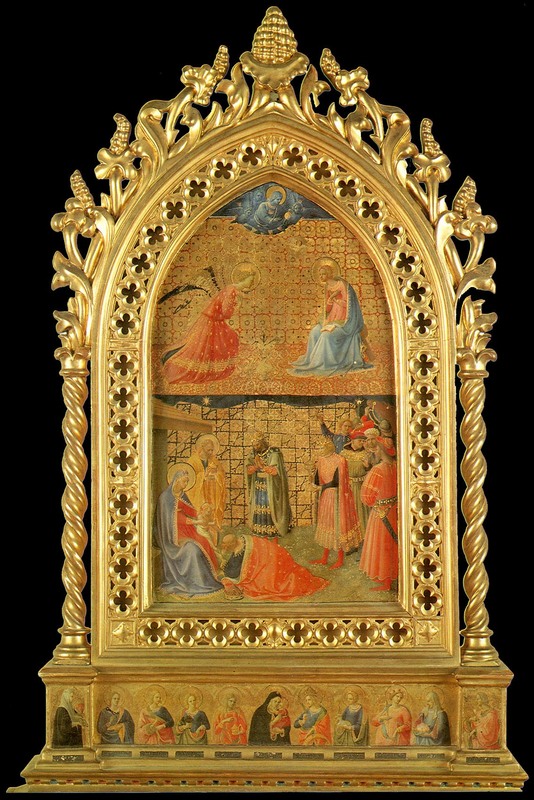 The Gardner Dormition and Assumption of the Virgin is commonly believed to belong to a series of four reliquaries painted by Fra Angelico for Santa Maria Novella, which were described by Vasari in both editions of his Vite (1550 and 1568) and were said by Richa to have been commissioned by the sacristan of the church, Fra Giovanni di Zanobi Masi: "... quattro tavole, o sieno tabernacoli di legno pieni nelle cornici di Sante Reliquie, e dipinti dal B. Fra Giovanni Angelico, Patti fare da Fra Giovanni Masi; e veggonsi effigiati in minute figure, the sembrano miniature, i Misted della vita di Maria Vergine. "(*1) The date of Fra Giovanni Masi's death, reasonably considered a terminus ante quem for the commission of the reliquaries, was reported as 1430 in Father M. Billiotti's sixteenth-century chronicle of Santa Maria Novella,(*2) and corrected to 1434, following a notice in the Necrologia di Santa Maria Novella, by Stefano Orlandi in 1955. Consequently, references to the four panels prior to 1955 consider them among Angelico's earliest known paintings, whereas later authors treat them as works from the artist's maturity. Three of the four reliquaries from Santa Maria Novella were described in 1847 when they were still housed in the sacristy of the church. 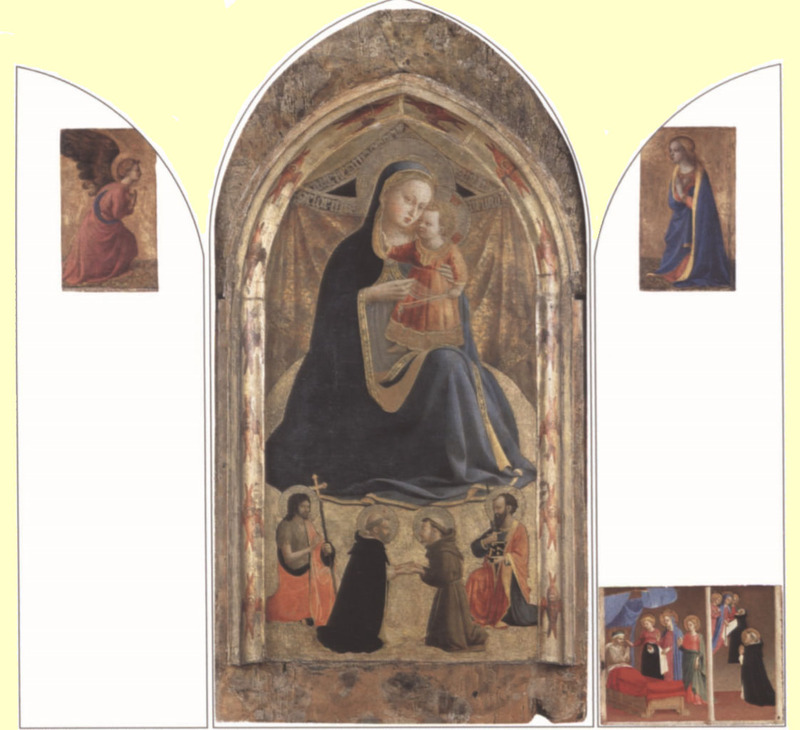 (*3) Now in the Museo di San Marco, these represent: I) theVirgin and Child with angels and, in the predella, Saints Dominic,Thomas Aquinas, and Peter Martyr, popularly known as the Madonna della Stella (fig. 80); 2) The Coronation of the Virgin with, in the predella, an unusual representation in half-length of the Nativity with six angels (fig. 81); and 3) The Annunciation and The Adoration of the Magi with, in the predella, the Virgin and Child and ten half-length female saints (fig. 82). There is no documentary or incontrovertible physical evidence that the Boston panel, which was in the collection of the Reverend John Sanford at Nynehead, Somerset, by 1816,(*4) is the missing fourth reliquary except that it corresponds to the others in size, and its subjects complement those of the other paintings, supplying important episodes from the life of the Virgin otherwise conspicuously absent from the series (the church of Santa Maria Novella is dedicated to the Assumption of theVirgin). None of the three reliquaries now in San Marco preserves its original frame wholly intact, although neither do they seem to have been significantly altered in format. Triangular inserts were added at the upper corners of the Gardner Museum panel to complete a rectangular shape; these inserts, and a four-centimeter-wide border of the triangular gable, now covered by the frame, have been overpainted with a blue sky and clouds, and a two-centimeter-wide border along the sides and bottom of the panel has been regilt. Otherwise, this panel differs from the others chiefly in its lack of a predella and of any remnants of compartments for relics, which, however, would have been lost with the destruction of its original frame. Diane Cole Ahl adduced the evidence of a later niello pax by Donato di Leonardo and Antonio di Salvi in the Walters Art Museum, Baltimore, to contend that the Gardner Dormition and Assumption of the Virgin had undergone more extensive changes than in shape alone. (*5) The pax copies both the overall composition of the Gardner panel and many of its details, omitting others in order to compress the spatial content of the scene into the more limited pictorial surface available to the engraver. Cole Ahl's assertion that the landscape elements visible above the wall in the Gardner panel are modern additions because they do not appear on the pax is untenable. Equally, the round-arched top of the Baltimore pax is not a reliable guide to the probable original shape of the Gardner panel since it is typical of late-fifteenth-century paxes but not of early-fifteenth-century painted or carved reliquaries. 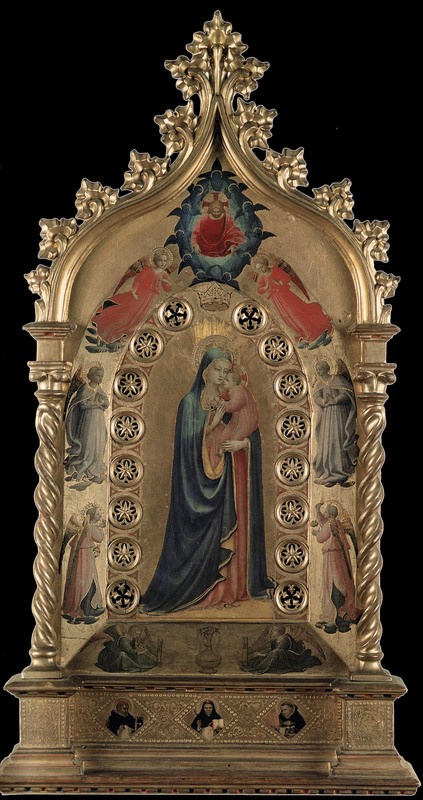 It is likely that the Gardner panel was not significantly different in shape from the Madonna della Stella in the Museo di San Marco, which, of all Fra Angelico's paintings, is also the one it most closely corresponds to in size and proportions. 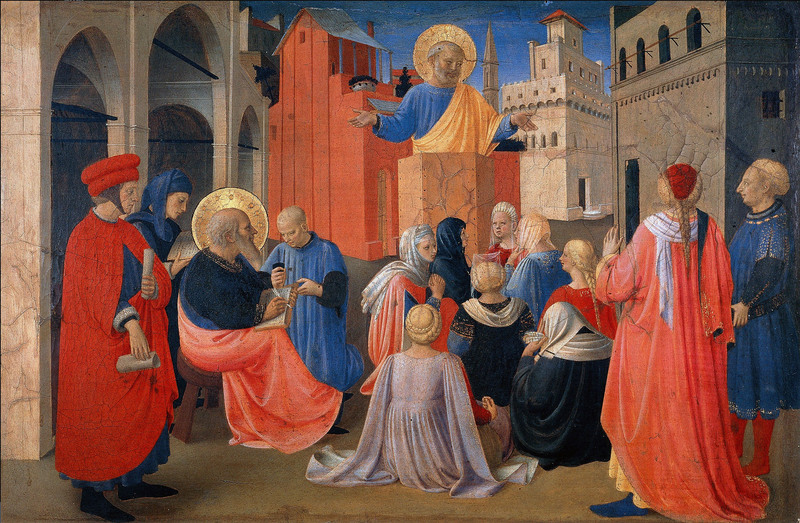 Discussions of the authorship and dating of the Dormition and Assumption of the Virgin reveal a contentious divergence of opinion in part reflecting the biases of successive generations of students of Fra Angelico's work and in part the Gardner panel's relative inaccessibility to European scholars, other than in photographs. Among early writers, few besides Berenson and Langton Douglas, both of whom knew the picture well and at firsthand, considered it substantially autograph. (*6) A majority of scholars attributed its design to Angelico but its execution, particularly in the lower scene of the Dormition, to assistants in his studio, while several(*7) ascribed it to Zanobi Strozzi or to another illuminator active in Angelico's immediate circle. 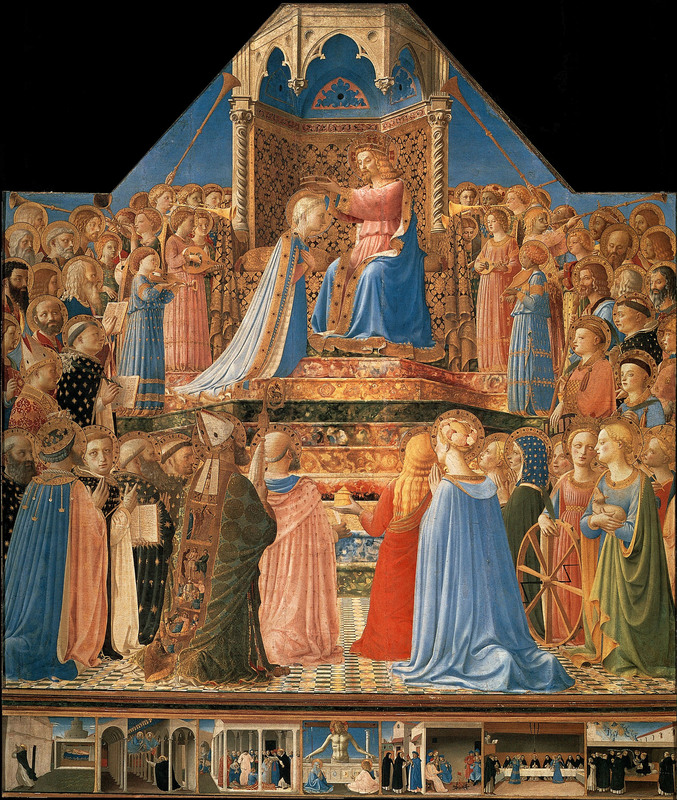 Based only on considerations of quality and technique, it cannot be doubted that the Gardner Dormition and Assumption of the Virgin is wholly autograph — one of Fra Angelico's most ambitiously conceived and meticulously rendered works. The sophisticated organization of space in the lower scene and the carefully calibrated ring of angels seen di sotto in su in the upper register parallel the accomplishment of Angelico's majestic Coronation of the Virgin altarpiece in the Louvre (fig. 74), while such details of naturalistic observation as the modeled shadows in the cloth-of-gold drapery where it is pulled over the poles of theVirgin's bier (realized in translucent glazes over engraved gold leaf), the subtle narrative psychology of the four apostles bending to lift the bier, or the individualized features and expressions of all nineteen figures in the lower scene are only encountered in Florentine painting in the mature works of Fra Angelico. In considering both the attribution and the dating of the four Santa Maria Novella reliquaries, scholars have tended to treat them as a unified group. It was pointed out by Strehlke,(*9) however, that, while they were apparently conceived as parts of a single decorative program, their manufacture may have been protracted over a period of time. Liana Castelfranchi Vegas,(*10) following a suggestion by Roberto Longhi, observed that the patron of the panels, Fra Giovanni Masi, was provost of the sacristy of Santa Maria Novella in 1424 for one year only, and she proposed that year as the likeliest date for the commissioning of all four. One of them, the Madonna della Stella, does conform somewhat, in figure style, to other paintings of this period, although its closest analogies are to the Prado Annunciation altarpiece of about 1425-26. The remaining three reliquaries are significantly more mature efforts. 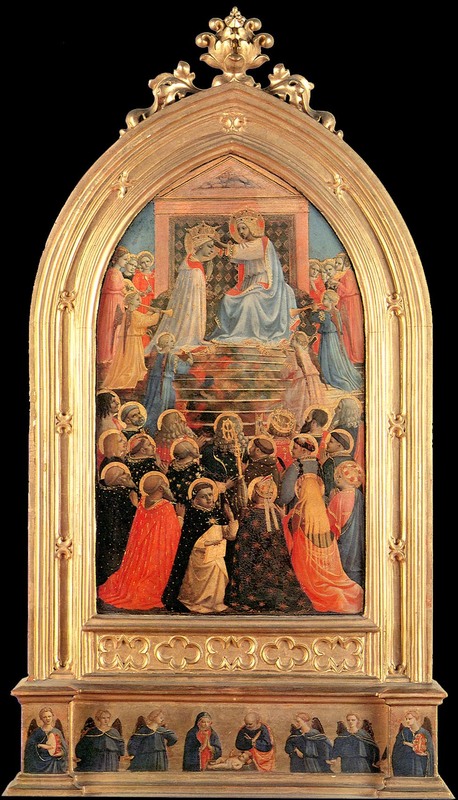 The Coronation of the Virgin, for example, displays more sophisticated handling of space and chromatic range than does the Madonna della Stella and its figure style relates closely to that employed in the Parma tabernacle (cat. 21) or, more approximately, in the Franciscan predella of about 1428-29 (cat. 24); it probably was painted about 1427 or 1428 — the second in the series to be finished. 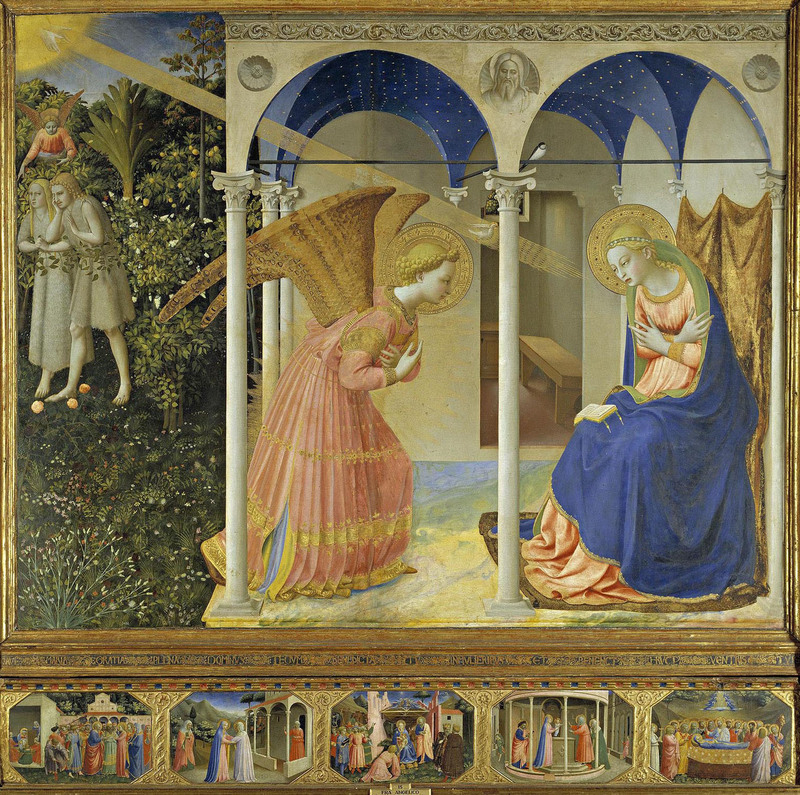 The Annunciation and Adoration reliquary, on the other hand, is clearly an even later work, dating from the period after 1430 when the influence of Masaccio on Fra Angelico was visibly waning. 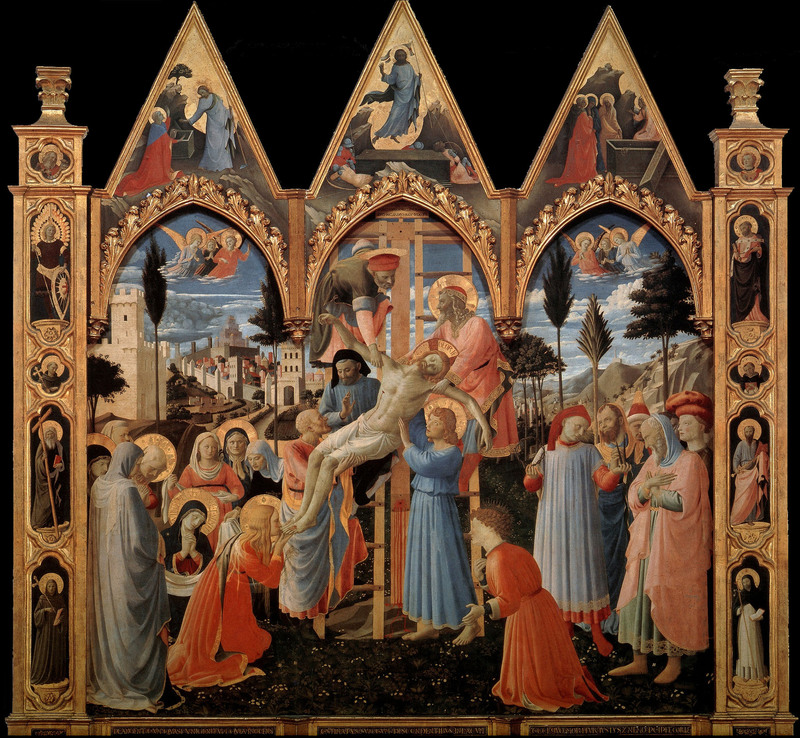 Its figure types, spatial structure, and modeling technique correspond to those in the pilaster panels from the Santa Trinita Deposition altarpiece, known to have been completed by 1432, and even more so to the predella scenes below the Coronation of the Virgin altarpiece in the Louvre, very likely painted in 1432 or 1433 (see p. 139). A date of about 1432, immediately preceding work on the Louvre altarpiece, seems most plausible for this reliquary. Фра Анжелико. Пределла алтаря Коронование Богоматери. The Gardner Dormition and Assumption of the Virgin is in many respects the most original and complex of the four reliquaries from Santa Maria Novella. 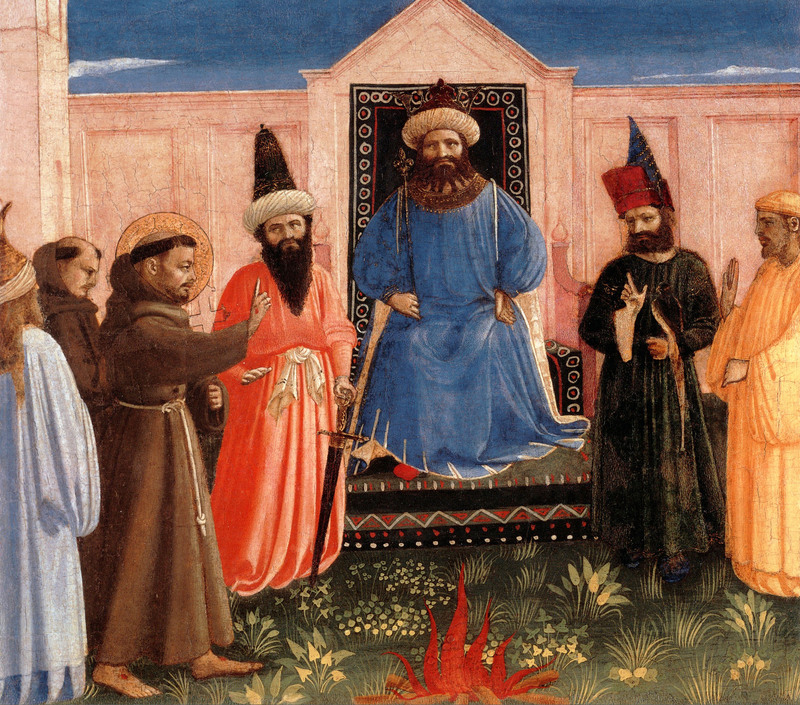 It was probably the last of them to be painted and may have been commissioned only shortly before Giovanni Masi's death in 1434. The lucidity of its spatial structure and the precision and density of its textural and decorative detail obviously call to mind the Louvre Coronation of the Virgin altarpiece and its remarkable predella. The Gardner panel advances even beyond these, however, toward a full and seemingly effortless assimilation of naturalism that characterizes the predella to the Linaiuoli tabernacle (cat. 29), commissioned in 1433 and presumably completed by 1436. Assuming the Gardner reliquary was not — as contended by Pope-Hennessy and Berti(*11) — commissioned after Giovanni Masi's death, and was simply grouped together with the other reliquaries for lack of reliable information to the contrary, a date for it of about 1433-34 seems convincing. (*1). Vasari (Milanesi ed.) 1878-85, vol. II, p. 513; Richa 1755, P. 49. (*2). Archivio di Santa Maria Novella, Chronica pulcherrimae Aedis Sanctae Mariae Novellae, fol. 24; first published in Marchese 1845-46, vol. I, p. 270. (*3). Kugler 1847, vol. I, p. 358. (*4). Sanford collection, 1847, no. 29. 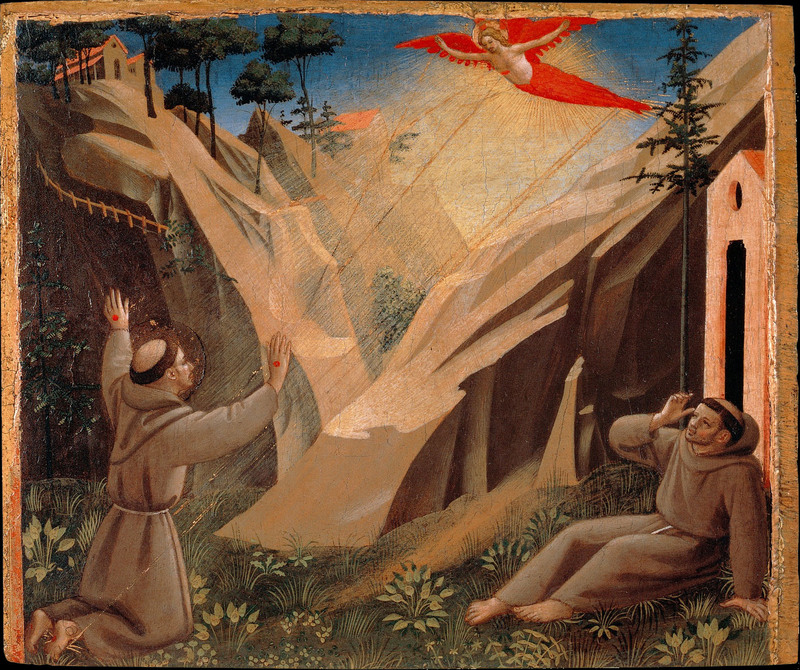 The panel was lent by Sanford to the British Institution in London in 1816, the first Italian Quattrocento painting known to have been publicly exhibited in the British Isles. (*5). Cole 1977, pp. 306-12. (*6). Douglas 1900, pp. 34-38, 196-97; Berenson 1904 p. 99; Berenson 1909, p. 104; Schottmuller 1911, pp. xviii, 23, 228, 239, 241, 247. (*7). Van Made 1928, pp. 46, 50; Collobi-Ragghianti 1950b, part 2, p. 25 n. 20; Collobi-Ragghianti 1955b , p. 43; Pope-Hennessy 1952, pp. 199-200; Pope-Hennessy 1974, pp. 222, 224-25; Berti 1963, p. 38 n. 101. (*8). Boskovits 1976a, p. 47 n. 11 ; C. B. Strehlke, in Kanter et al. 1994, PP. 342-45. (*9). C. B. Strehlke, in Kanter et al. 1994, pp. 342-45. (*10). Castelfranchi Vegas 1989, p. 43 n. 27. (*11). L. Berti, in Florence 1955, pp. 7-8. In the first edition (1952) of his monograph on Fm Angelico, Pope-Hennessy dated the reliquaries between 1435 and 1440; he revised this dating to "about 1430-34" in the second edition (1974).